This tile is really beautiful, but I wish the sample was full size. So, I ordered enough to make the actual size of the tile. Something like this you need the actual size to visualize what it’s going to look like. I would pay more $$ for the actual tile size. The SomerTile 7.75x7.75-inch Cavado Blue Ceramic Floor and Wall Tile captures the artisanal look of cement tiles. 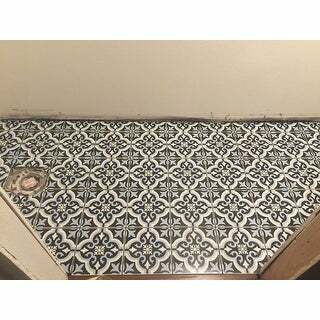 This low sheen tile features a fleur-de-lis white and pale blue design on a charcoal gray background. 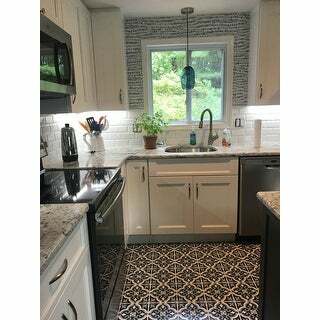 This encaustic look tile features a slightly textured finish for added slip resistance. 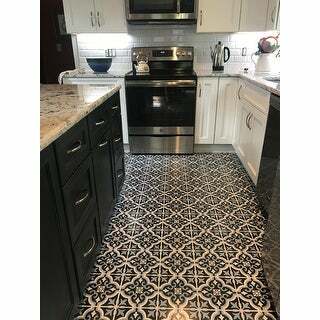 Use this durable tile by itself or pair it with many of our other products, including others in the Cavado series as an accent for many applications within your home. I tiled a very small half bath under the stairs. But this floor just pops this small space. I used black grout and couldn't be more happy with the results! Couldn’t be happier with this tile! Beautiful, durable floor. I have one entire wall in the kitchen done with these tiles. I love it. looks great in our powder room, used dark smooth dark grout to complement the blue/gray in the tiles. also used them on the wall to form a line along the backsplash. This tile is very aesthetically pleasing to the eye. This is one of the prettiest patterns I could find (and I have done a long and thorough search). It is also a very strong tile as you would want for a floor. However, the clarity of the colors is a bit more muted than I expected and have a “filmy” look. Still beautiful. This tile is gorgeous!! We had no issues with broken tiles or anything. The shipment was quick & tiles installed perfectly. They are so good looking & everybody who sees them remarks positively. These were put in the powder room. Update - This is a strange thing to suddenly notice, but I just realized the center pattern is not square. Sadly, my contractor didn't notice either so there is actually a random pattern in my floor where some tiles are oriented 90°out. It's off by less than 1mm so I have to wonder why and if it is some kind of error. They still look beautiful, but I'm not very happy to see this weird inconsistency in what is otherwise a perfect geometric pattern. Excellent quality. Much easier to work with than cement tile. The pattern is sharp and the colors are pretty. Our bathroom turned out beautifully. The tiles are beautify and the size is easy to work with. They were packed really well and I did not find any broken tiles. I would definitely order these again. Arrived with no broken tiles, looks great, good price on a good product. The tile is a showstopper! Everyone who sees it is "wowed" and raves about it. It arrived well packaged and relatively intact. Only a handful of tiles had any breakage and it was minor and able to be cut off. The only reason for the 4 star rating is that delivery tracking was not accurate and I had to call a few times to find out when it was going to arrive. I had a contractor waiting so accurate shipping time would have been very helpful. Regardless, I love the tile so it was totally worth the wait! Put these tiles on the wall of my laundry room behind my washer and dryer. They turned out so cute! Great detail in them. Absolutely LOVE this tile as a kitchen backsplash!!! I was afraid that it might be too much but it looks amazing - makes the kitchen! Would definitely recommend! 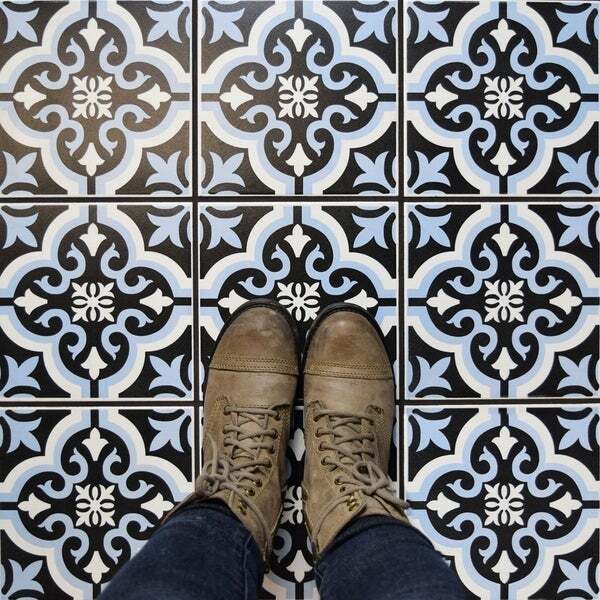 Everyone loves these tiles. I used them as a fireplace surround! The project is in progress. Beautiful tile! I put it in a small bathroom & it turned out great. Would recommend this product. "What's sq footage for each box?" "Can I use this for replacing the tile in my pool? I put it in my kitchen and really like it. I think it would also be pretty to tie it into other spaces around the house and since I need to replace the tiles in the pool anyway I'd like to use it there unless it won't stand up to the pool chemicals"
We would not recommend this product for a pool installation as it is semi-vitreous, which means it has a water absorption of more than 3% but less than 7% for indoor use, and is not frost resistant. "Is this tile water resistant enough to use in a shower?" All of our tiles can be used in a shower. This tile is glazed, so as long as it is installed correctly, and the background construction and shower pan are adequately waterproofed, it will be perfect for this installation. 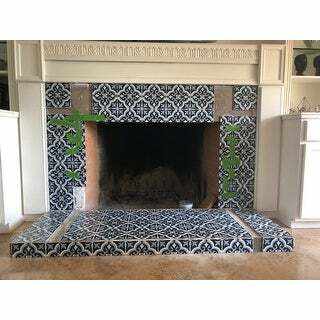 It looks like high-end encaustic cement tile for about 10% of the price. loved the colors and design. plan on putting it around our fireplace and hearth. "Is the dark color on this tile black, navy or gray?" In my opinion the color is navy. In my opinion its more of a sky or pale blue. "Can you get a sample tile ?" Unfortunately, we are unable to provide sample tiles. We apologize for any inconvenience. "Does the tile have a shine or is it a matte finish?" This tile has a glazed finish and would be a low sheen, more matte.